The undead hordes are back... to eat the brains of more players! Run, Fight, or Die! 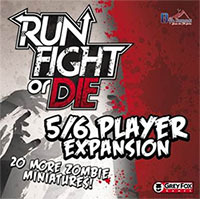 5/6 Player Expansion adds two action boards, two character boards, and twenty walkers, allowing up to six players to join your game of Run Fight or Die! This expansion comes in an extra large box so that you can store all the goodies from other expansions in one place. Add a Review for "Run, Fight, or Die! 5/6 Player Expansion"